Liberia is a country in West Africa, and its entire western border is the Atlantic Ocean. It does not have many tourist facilities, but if you are looking for adventure, this is the place to go. One of the most exciting experiences you can have in Liberia is to explore the rainforests. However, you should never go alone, and caution is advised since you can put yourself in danger because of the wildlife. Even so, the scenery is gorgeous. Beaches are another option, and there are plenty of them too. After all, the Atlantic Ocean covers the western border. Not all of them have tourist facilities, but you should have a lovely time. Lastly, do not forget that Liberia is renowned for its masks. You can buy some pretty much everywhere, but they make excellent souvenirs. Before traveling to Liberia, you need to see whether or not you need a visa to cross its borders. Actually, the chances of you requiring a visa are quite high since Liberia’s visa policy is not as liberal as one would want. Only the citizens of 15 countries are exempt from getting one, and visas on arrival are available only to the nationals of Taiwan, but only if they submit an application online before arrival. At the same time, visas on arrival are also available under certain circumstances to nationals of countries that do not have diplomatic representation of Liberia. The rest of the world needs to visit the nearest Liberian embassy or diplomatic mission and apply for a consular visa. If you are curious to know in which category you are in, you can look at the visa policy of Liberia yourself. However, we make another suggestion. You can use iVisa’s Visa Checker. Access the tool, which is located in the top right corner of this page, choose your country of origin from the left drag-down menu, and pick Liberia for the destination. 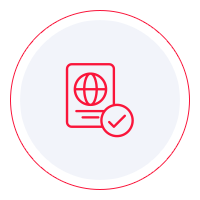 If you do not need a visa, the Visa Checker will let you know, but if you do, it tells you which type of visa you need and provides a list of embassies should you require to get a consular visa. One interesting piece of news is that the Liberian Government announced the introduction of the electronic visa system. The eligible nationalities will be able to apply online for the Liberia visa as of next year (2019). Until then, iVisa can only help you with some information. So, if you have any questions, you can contact our support service 24/7. The service is free of charge. Before going to the embassy, you need to make inquiries about the requirements. You can find that information online, but our advice is to not put your trust on every piece of information you see on the internet. Use it as a reference only. For more reliable information, you should contact the Liberian diplomatic mission. Even so, we can tell you that a Liberia visa application requires you to have a valid passport that does not expire for at least another 6 months from the date of arrival in Liberia. Also, you need to get vaccinated against Yellow Fever. We regret that we cannot assist you more with the Liberia visa application process, but we hope that the information above points you in the right direction.